SpaceX's Falcon 9 rocket launches from Cape Canaveral Air Force Station in Florida, carrying the Eutelsat 117 West B and ABS 2A communications satellites to orbit. The Falcon 9 lifted off from Florida's Cape Canaveral Air Force Station today at 10:29 a.m. EDT (1429 GMT). About 2.5 minutes later, the booster's two stages separated; the upper stage continued carrying the Eutelsat 117 West B and ABS-2A commercial communications satellites to a distant geostationary transfer orbit (GTO), while the first stage turned around and headed back to Earth. The Falcon 9 first stage comes down on the deck of a robotic "droneship" in a cloud of smoke on June 15, 2016. The landing was not successful, SpaceX representatives said. Then, less than nine minutes after launch, the first stage descended onto the deck of "Of Course I Still Love You," one of SpaceX's two autonomous, ocean-going landing platforms. SpaceX's live video feed cut out during the landing attempt, so it's unclear exactly what happened. But Musk soon confirmed that the booster didn't survive the touchdown try. SpaceX representatives had cautioned before today's launch that the landing would be tough. Rockets toting satellites to GTO have to travel very fast, which means that the Falcon 9 first stage was subjected to very high temperatures and forces when it came back into Earth's atmosphere. "Looks like thrust was low on 1 of 3 landing engines. High g landings v sensitive to all engines operating at max," Musk tweeted today. "Upgrades underway to enable rocket to compensate for a thrust shortfall on one of the three landing engines. Probably get there end of year," he said in another tweet, adding that the droneship is OK and that video of the landing attempt will probably be available later today. Landings during GTO missions, while difficult, are not impossible. SpaceX's two previous droneship rocket touchdowns — successes that occurred on May 6 and May 27 — also came during launches to the distant orbit. So today's RUD ends SpaceX's streak of successful ocean landings at three. SpaceX also brought a Falcon 9 first stage back on land at Cape Canaveral in December, during the launch of 11 satellites for customer Orbcomm. 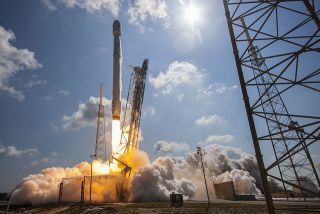 These touchdowns, and the failed attempts as well, are part of the company's effort to develop fully and rapidly reusable rockets, a breakthrough that Musk has said would cut the cost of spaceflight dramatically. Ideally, SpaceX would prefer to land every rocket on terra firma, at or near the launch site; doing so would speed up the inspection and reflight processes. But some missions require so much fuel that the booster can't make it all the way back, and must therefore come down on a droneship. The Eutelsat 117 West B and ABS-2A satellites will be operated by the communications-services companies Eutelsat and ABS, respectively. Eutelsat 117 West B was successfully deployed today about 30 minutes after liftoff, while ABS-2A began flying freely 35 minutes after launch.